BootListings is a Classifieds template designed entirely using Bootstrap 3. It uses a minimalist style, making your site look uncongested without sacrificing functionality. A minimalist Bootstrap classifieds template - ideal for kick-starting your own classifieds site. BootListings is a Classifieds template designed entirely using Bootstrap 3. It uses a minimalist style, making your site look uncongested without sacrificing functionality. The layout makes it easy for users to quickly locate what their looking for without being overwhelmed by the different options. It also clearly highlights the "post and ad" button and has an easy to use interface to submit a listing. It's fully responsive and works on all devices. Being built with LESS, the process of changing the colours and theme is simplified. You can also easily add and remove components without having to play with the styles. 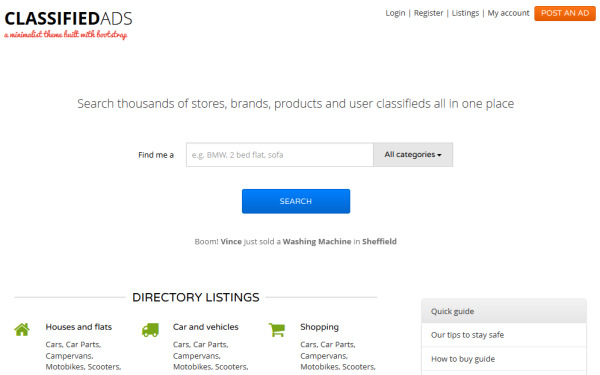 BootListings makes it easy and fun to develop your next classifieds website. Note: Images shown in the preview are for demo purposes only. Don't forget! Because you're using a theme built with Bootstrap, you get access to everything in the Bootstrap component library and ecosystem. It's an excellent base for your next Classifieds website. It's simple to customize and change themes.